MERQ runs an annual seminar series on topics relating to medical and health education research as well as providing professional development opportunities. If you would like to be notified of forthcoming MERQ Seminars, please join our seminar mailing list. Our understanding of how to reduce cancer risks at the population level is becoming better, particularly as a result of our efforts in tobacco control and skin cancer which has had the benefit of over 30 years of investment by governments and civil society to tackle the issue. 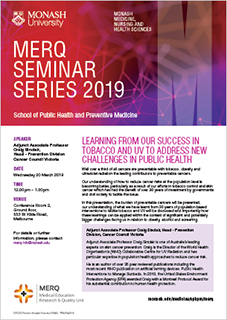 In this seminar, the burden of preventable cancers will be presented, our understanding of what we have learnt from 30 years of population based interventions to tackle tobacco and UV will be discussed and importantly how these learnings can be applied within the context of significant and potentially bigger challenges facing us in relation to obesity, alcohol and screening. For information about the 2019 seminar program, please contact us.